It’s been said that we eat with our eyes first. When Krispy Kreme Doughnuts needed a way to make their new location stand out, they turned to us, and we set a plan in motion. A global retailer of premium-quality sweet treats, Krispy Kreme Doughnut Corporation is a big brand that’s headquartered in Winston-Salem, N.C. Founded in 1937, the company has 1,400 retail shops in 33 countries. Krispy Kreme’s new Utica, Michigan, location needed Vinyl for Textured Surfaces for their opening in January. Our team communicated closely with the customer and installers every step of the way, and we printed the graphics and coordinated the installation in record time. This is the story of how we achieved this, complete with sprinkles on top. Rough Wrap is a 2.1 mil vinyl material with a laminate over top that’s designed for large textured surfaces like wall murals, indoors and outdoors. The vinyl is applied using heat and has the appearance of paint when it molds to the textured surface. When selecting the visual and color for a brick surface, it’s important to consider the color of the brick where the visual will be installed. “Krispy Kreme needed us to achieve just the right shade of gray for the adhesive to work with the brick color. To help them find the right one, we sent multiple gray color swatches and samples to test the shade that worked best on the interior brick,” explains Lacey. To simplify the installation process, once the color was selected the 40 Visuals team printed the Vinyl for Textured Surfaces graphics in smaller sections. We printed eight full wall visuals and split them into 67 total pieces to make them easier to work with and install. The individual pieces were up to 106″w x 42″h in size. Then the 67 pieces were each contour cut by our team to the exact specifications. Next mockups were created for the installation team that showed where the different sections attached together to create the whole image. “Since we coordinate nationwide installations, we make sure installers have a guide to follow,” adds Lacey. We also produced several Adhesive Vinyl and Ultra Clear Window Clings for the display, which tie the theme together and give the store a consistent look. The Ultra Clear Clings include shop hours, drive-through hours and Wi-Fi decals that were created for the windows. Another great example of this application is the story of how Luke’s Lobster restaurant in New York City is using Printed Vinyl That Gives the Effect of Paint on Brick Walls. 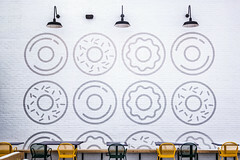 If you’re interested in learning more about how other doughnut shops, coffee shops and restaurants are leveraging Vinyl for Textured Surfaces, please give us a shout at 800-962-3119 or click one of the links below. When you think of a fitness club, huge wall graphics don’t normally come to mind. Usually, we imagine the ripe smell of sweat and the loud sound of clanking weights. When you walk into an LA Fitness health club, however, the feeling is different. With huge motivational graphics wrapped on the walls, you can’t help have a little more jump in your step. The overall appearance of the gym actually puts you in the right state of mind to sweat. LA Fitness Clubs are located in over 200 locations around the country. At all locations the textured wall vinyl graphics are displayed with the same material, some spanning over 50 ft wide, giving all the clubs the same cohesive look. The images and text are aimed directly at members’ inner motivations, and they are unmistakable. Each section of the gym is marked with a different wall graphic with a single word that describes WHY you are there. Strength, energize, achievement, invigorate, focus. These words remind us of why we go to the gym in the first place. At LA Fitness, they are scrolled across the walls as huge vinyl graphics, so you can’t forget. The material has a rough texture, almost gritty, which matches the overall aesthetics of the gym. The backing of the material has adhesive stick, so the graphics are applied similar to wall paper. The texture also adds the level of durability that regular adhesive vinyl does not. Large wall wraps like this are used as printed signage for several fitness and health clubs. How do I learn more about Textured Wall Vinyl Graphics? If you are looking to wrap your walls with printed vinyl like LA Fitness Clubs, you came to the right place. Although we did not produce the graphics at LA Fitness, we are very experienced in producing and installing large vinyl graphics. 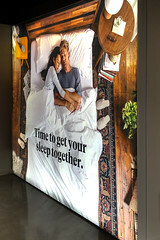 If you are interested in learning more about how retailers are using Textured Wall Graphics please give us a shout at 800-962-3119 or click one of the links below. The newest exhibit at Chabot Space & Science Center features a massive outer space themed Fabric Lightbox. The backlit fabric material shows all of the amazing colors in the galaxy scene. The exhibit is called “Going the Distance: Our Reach into Space” and features content provided by NASA Ames Research Laboratory, Caltech’s Jet Propulsion Laboratory, Planet, and SpaceX. The wall mounted display measures 168″W x 96″H in size and takes up a large portion of the room. LED lighting is distributed around the perimeter of the lightbox so that the graphic is evenly illuminated. The large size creates a very interactive experience and many people have already been posting photos of themselves posing in front of the unique backdrop. Fabric Lightbox displays are becoming more popular in museums because of the ability for the SEG fabric graphics to be swapped out with each exhibit. Once the lightbox is installed, it is a very easy process to replace the fabric with a new design. Another popular option is to use a non-lit display which would use a frame instead of a lightbox. This type of display would use the existing light source allowing it to be used in multiple locations. The frameless appearance is another added bonus to this product. Larger sizes like this one really transform the space and makes it a more memorable experience for viewers. How do I learn more about Lightbox Displays? 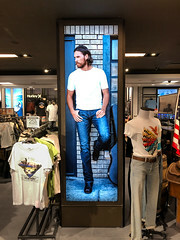 If you are interested in learning more about how retailers are using Lightbox Displays please give us a shout at 800-962-3119 or click one of the links below. Lights, Camera, Action! Last month we produced and installed 3 different Lightbox Displays with SEG Backlit Fabric at Action Water Sports’ new location in Central Florida. The graphics emphasize their boating lifestyle that brings families together. With their brand new showroom, fully stocked pro shop, service center, and private ski demo facility, you can always count on Action Water Sports for all of your boating needs. 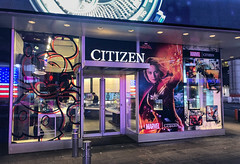 Lightbox Displays are a top choice for brands and retailers because of their illuminated vibrant appearance. The big advantage of using SEG Fabric is how customizable the size and scale can be. For a large showroom with enormous boats taking up a lot of the space, it’s important to keep the signage large enough so that it can still have an impact on the customer. These SEG Lightbox Displays use perimeter LED lighting compared to traditional ultra thin lightboxes that have a full LED panel behind the image. Unlike traditional lightboxes that use a frame to snap down and secure the graphic, SEG Lightbox Displays have a modern edgeless appearance that is growing more popular in retail displays. We recently completed a Nationwide Signage Rollout for IWC Schaffhausen. Over the past month, our team produced 100 graphics and professionally installed at over 30 different locations across the US and Canada. 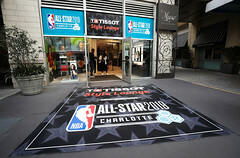 The signage medias produced included SEG Fabrics, Duratrans, Adhesive Vinyl, and Perforated Vinyl. Our installation services are offered to ensure that graphics are installed precisely with care. These services include project management, site surveys, graphic installation, and removal. Professionals are certified and understand the specifications for each product. We coordinate this process with the installer and the store to ensure that projects are completed on time. After the installations are completed we receive photos from the installer to make sure every job is done to perfection. Along with these services, our signage management software makes rollouts even easier. This software is designed to meet the needs of everyone in your brand’s marketing channel. It gives a unique shopping experience and makes it very easy to look at all accounts and easily replace and roll out new artwork to stores. It also gives you the ability to set budgets, view reports, and manage orders and accounts for your brand. How do I learn more about Signage Rollouts? If you are interested in learning more about our Installation Services or Signage Management Software please give us a shout at 800-962-3119 or click one of the links below. Why Choose SEG Fabric Displays? When it comes to signage, the options are endless but it can be difficult to choose the right media to hold the attention of shoppers. In a recent study, 7 out of 10 shoppers said that signage influences their buying decisions. In our fast-paced advertising environment, it is critical to find a media that clearly stands out. One of the fastest growing product categories for our company is a fabric print product called SEG. The big advantage of SEG is its customizable size and scale. If you’ve been to a shopping mall, retail store, convention center, or arena lately you’ve probably gotten a glimpse of this material. 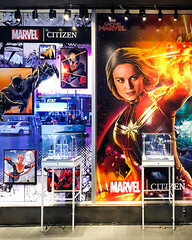 SEG Fabric Displays have become the top signage choice of brands and retailers in POP environments because of their modern and unique appearance. What are SEG Fabric Displays? SEG stands for Silicone Edge Graphics. SEG is a printed fabric with a thin silicone beading sewn around the edge. Once inserted into the frame the fabric has a smooth matte finish, available in bot non-lit and backlit options. This application is growing in popularity and can be seen in many different retail environments. What brands are using SEG Fabric Displays? Several brands have recognized the benefits of SEG Fabric Displays including TAG Heuer, Under Armour, Apple, Longines, Sally Beauty, Nike, Tesla, Topshop, Daniel Wellington, Citizen, and many others. What are the benefits of SEG Fabric Displays? Interchangeable Graphics – Once the hardware is installed, the fabrics graphics are very easy to swap out and can be done in minutes by someone without experience. Modern Appearance – The bold premium fabric stands out and attracts customers with its frameless look. High Definition Printing – Our fabrics are printed with the newest dye-sublimation technology having lifelike color vibrancy. Easy to Ship – The lightweight fabric can be folded or rolled and the frames break down for easy shipment and storage. Shipping costs are lower than that of a rigid sign of the same size. Durable – The fabric is extremely durable and has a long-lasting vibrant color. The fabrics can be easily cleaned in the event of a spill. Customizable – The frames and lightboxes are customizable and can be produced in unique custom sizes and shapes. SEG Fabric Displays can be wall mounted, double-sided, freestanding, or ceiling suspended. Backlit or Non-lit – 40 VISUALS offers SEG fabric in both non-lit and backlit options to suit application needs. Non-lit or Backlit SEG Fabric Displays? SEG Fabric can be printed not only for regular SEG Frames but also for backlit signage being displayed in a light box. Whether the application is non-lit or backlit will determine the type of fabric used. Fabric for backlit applications will require a denser woven material to help diffuse the light, while non-lit applications require a lighter more flexible fabric. We have done extensive color testing and profiling to make sure the colors pop in both non-lit and backlit applications. Backlit SEG Fabric is printed with higher ink saturation giving the fabric a darker appearance until it is installed in a light box. Once installed in the light box, the colors are perfectly profiled once illuminated. Non-lit SEG Fabric is printed with a more true to color representation and can be viewed without the addition of lighting. Backlit displays use LED lighting to evenly illuminate the dense colors in the fabric. Non-lit displays use an existing light source allowing these to be placed almost anywhere. How do I learn more about SEG Fabric Displays? 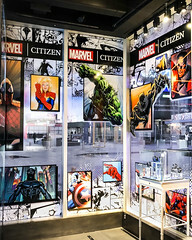 SEG Fabric Displays are the top choice of brands in retail environments. If you are interested in learning more about how retailers are using SEG Fabric Displays please give us a shout at 800-962-3119 or click one of the links below. We gave Sally Beauty stores a makeover by updating their retail displays with Frameless LED Lightboxes and Backlit SEG Fabric. Sally Beauty is one of the world’s largest retailers of salon-quality hair color, hair care, nails, salon, and beauty supplies. They have more than 2,800 stores worldwide. Sally Beauty wanted something to make their graphics stand out so we replaced their signage with SEG Fabric Displays. For this specific location in Columbus, Ohio we produced 39 total 48″w x 14″h Wall Mounted Lightboxes with SEG Backlit Fabric. The lightboxes were mounted side by side above the store fixtures, allowing for us to daisy chain the wiring. We predrilled the lightboxes and ran the electrical through the sides making for a seamless electrical transition from lightbox to lightbox. Daisy chaining allows us to limit the number of power chords used eliminating the need for excess wall outlets. With the 48″w x 14″h size utilized, we were able to daisy chain 8 lightboxes to one shared chord. To accomplish this we recommend using our nationwide installation services for larger projects. Interchangeable Graphics – After the initial installation, the fabrics graphics are very easy to swap out and can be done in minutes by someone without experience. Backlit or Non-lit – 40 VISUALS offers SEG fabric in both non-lit and backlit options to suit your application needs. We had the opportunity to produce a SEG Fabric Display for TAG Heuer’s Museum in Motion Exhibition. The global exhibition featured TAG Heuer’s iconic timepieces to showcase their watchmaking history and celebrate the 55th anniversary of their classic Carrera. We printed several different SEG Framed Fabrics that were featured in this unique space. The combination of multiple different medias helped bring this display to life across the world. How do I learn more about Fabric Displays? SEG Framed Fabrics are popular with events because of their lasting quality and portability. Unlike other substrates, the framing system can be unassembled and fabric can be folded down to make it very economical to ship between locations. If you are interested in learning more about how retailers are using SEG Framed Fabric or other medias please give us a shout at 800-962-3119 or click one of the links below. We created a Freestanding LED Light Box Trade Show Booth with SEG Backlit Fabric for Agility Fuel. The double-sided light box measured 240″w x 120″h in size. We also created a custom parallelogram shape for this space which held up a monitor and measured 72″w x 96″h in size. Lightboxes with SEG Fabric are becoming popular at trade shows because of their unique look and portable structure. How do I learn more about Light Box Displays? We recently produced a custom curved SEG Light Box and Backlit Fabric for a Duty-Free store retail display. The column has an 18″ radius and it’s made up of two different sections to create the curve. This unique shape utilizes forward throwing light sheets to illuminate every angle. The structure allows the graphic to be viewed from all angles of the store, and the backlit appearance really stands out from other signage. Once the structure is installed it is very easy to swap out different SEG Backlit Fabric graphics with changing promotions.